Love cats as much as we do? Welcome to the best on line source for cat lover gifts and cat collectibles. Catty Corner is home to true kitty themed classics for cat people like collectible cat plates, vintage figurines, cat books, comic cat characters merchandise, apparel, jewelry, and much more. Rediscover old favorite cats including such vintage collectibles as Garfield, Felix, Sylvester the cat, Kitty Cucumber, and Catwoman. 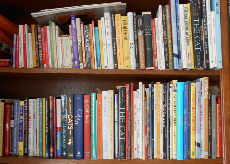 Curl up with a collectible cat book. Pick up something for kitty while shopping for yourself. Invite people onto a pleasant porch with waving house flags, yard spinners, and wind chimes. Have a cup of coffee or cold iced tea in a bright kitchen with amazing aromas wafting from the ovens. Catty Corner has cute kitty cups and mugs with old favorite characters, aprons, potholders, cutting boards, and timers. Hang up kids artwork, reminders, and cat recipe cards with cat fridge magnets. Have Garfield join you for dinner with fun salt & pepper shakers. Decorate a comfy cat lover's home inside & out in purr-fect feline style. Find awesome decor & nick-knacks like Calico Kittens figurines, light switch covers, cat & kitten doormats, and garden welcome stakes. Keep it catty in the office with collectible cat books, mugs, stickers, pens, stationery, note cards, self-stick notes, and more. Take a break and play a few hands with cat-themed playing cards. Feel like going somewhere today? We have top quality cat apparel, jewelry, and accessories. Is it getting cold outside? Wrap up with cat scarves that match the pendants on your earrings, necklaces, and bracelets. Don't forget your purse! Catty Corner also carries Laurel Burch designer bags, handbags, totes, cosmetic pouches, and shoulder bags. 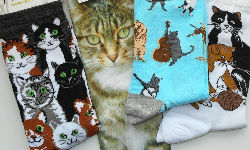 Slip on comfy cat socks or slipper socks at the end of the day and stretch out for a cat nap. Whether you're planning a party, extending condolences, or celebrating the holidays Catty Corner has gifts appropriate for every occasion. 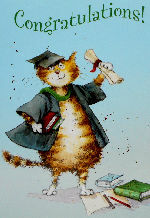 Pick up cat birthday or sympathy cards, cat gift bags, kitty wrapping paper, and note cards. We have thoughtful memorial gifts including picture frames, cat angel jewelry, memorial cat urns, and more. Decorate your tree with cat Christmas ornaments, the cat's meow holiday village, and other presents for cat people. We also have cats for Halloween, Thanksgiving, and Valentine's Day. If you can think of it, we have it including cat jigsaw puzzles, catopoly (monopoly) game, socks, stationery, collectible cat jewelry, collectible cats figurines, buttons, key chains, mugs, greeting cards and caps decorated with catitude.